CARIBOU — The Executive Committee of Northern Maine Development Commission's Executive Board is undergoing some changes do to municipal manager resignations. Ashland Town Manager Ralph Dwyer is now the Chairman of the Executive Board following the resignation of Caribou City Manager Austin Bleess, who presided over his final board meeting Thursday, Feb. 9. Bleess is moving to Texas to continue his municipal career. Dwyer was unanimously approved as the new Chair, moving up from Treasurer. Vice Chair Jon Frederick, Town Manager of Mapleton, Castle Hill and Chapman, also resigned, as he is taking a municipal job in Jaffrey, N.H. A nominating committee has been formed to fill the two open officer slots. Chief Brenda Commander of the Houlton Band of Maliseet Indians was appointed to the board as one of the two representatives of the County of Aroostook. In other news, Executive Board members were presented an overview of the Small Business Development Center (SBDC) activities of NMDC and at the statewide level. Loan Officer Dave Spooner said in Aroostook County the SBDC served 126 clients, which led to 82 jobs created or retained and 12 new business starts. Statewide the SBDC reported more than $47.1-million in capital generated, which is the most in Maine SBDC history. The focus of the Maine SBDC is to assist in the creation and the maintenance of viable micro and small businesses and the jobs they provide. NMDC hosts the Service Center in northern Maine, and serves Aroostook County as well as the towns and unorganized territories that border Aroostook in Penobscot, Piscataquis and Washington counties. Board members also approved a pilot project to offer co-working space at the NMDC office in Caribou. A start up entrepreneur or relocating business person is being afforded the opportunity to locate at Northern Maine Development Commission in Caribou rent free for six months. Lessons learned from this pilot project will be shared with member communities, which may wish to replicate the idea to attract busineses to their respective communities. Details will be available on www.nmdc.org in the near future. The next Executive Board meeting is scheduled for Thursday, April 13 at 3 p.m. at NMDC in Caribou. 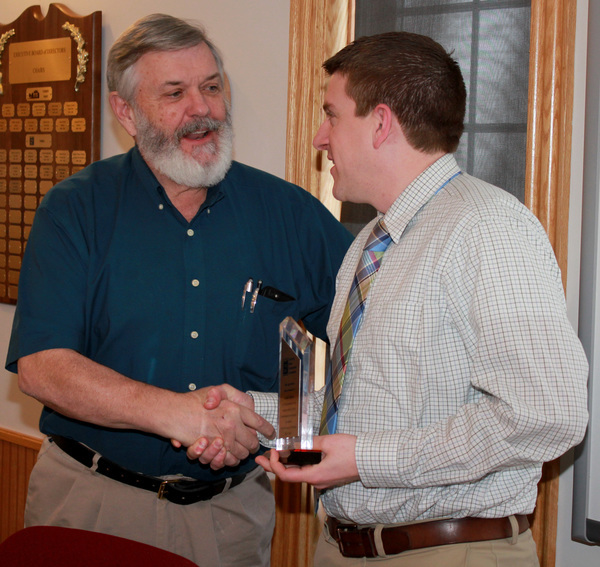 Photo caption: New NMDC Executive Board Chairman Ralph Dwyer presents a token of appreciation for his service to former Chair Austin Bleess. Scott Nash-Pelletier talks to some customers at Orchids in Madawaska. 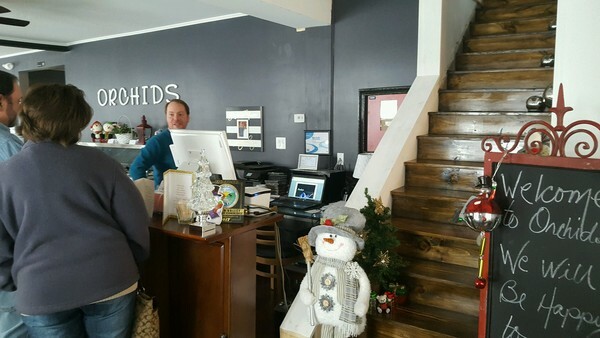 MADAWASKA — It has been a busy first few months since Alan and Scott Nash-Pelletier opened Orchids at the Fraser Mansion building in Madawaska. The pair have been busy getting reacquainted with customers from their previous restaurant, getting to know new patrons and even helping to raise funds to send the Pride of Madawaska Marching Band to the presidential inauguration. The Fraser Mansion, previously operated as a bed and breakfast owned by Robert and Linda Pelletier, boasted a successful business with rooms renting for up to $180 per night. In late Nov. 2015, the property sustained an unfortunate fire. After the fire, the owners decided not to reopen the business leaving a void in the heart of the town at this historical building. Orchids, LLC purchased the property from the Pelletier’s and began extensive renovations. Orchids was an existing restaurant in Madawaska until their lease was not renewed. The business operated at the prior location for a year with sales far exceeding original expectations. “Part of the reason for this is because of the unique fare we are able to offer, along with a strong attention to detail when it comes to food, and exceptional service when it comes to the customer,” said Alan Nash-Pelletier. It was because of the high demand and strong support from the local community that Alan and Scott knew they had to find a new, more permanent location for their restaurant. That’s when they secured financing through various sources including Northern Maine Development Commission (NMDC). It was at NMDC where Alan and Scott worked with David Spooner, Loan Officer and Josh Nadeau, Small Business Director to secure the final phase of financing to put the total project together. If you visit Orchid’s at 121 Fraser Avenue you can find both owners working within the restaurant. Alan typically manages the front of the restaurant while Scott serves as lead chef, and manages the operations out back. The Frasier Mansion also conveniently abuts Madawaska’s famous Four Corner’s Park, a local famous tourist attraction. Reservations can be made by calling 207-728-9232. You can also visit their website at www.orchidsfinedining.com. For more information about free small business counseling and small business loans, contact Nadeau, NMDC at 493-5765 or by email at jnadeau@nmdc.org or Spooner at 493-5766 or by email at dspooner@nmdc.org. AROOSTOOK COUNTY — Aroostook County Tourism (ACT), a committee of Northern Maine Development Commission, has announced that they will be fully redesigning and updating its tourism visitors guide for 2017. ACT will work on these efforts with Thalo Blue, an award-winning design agency with a focus on tourism and arts marketing, located in Auburn, Maine. The last major redesign of the visitor guide took place in 2009. Each year, 10,000 copies of the guide are produced and distributed by mail, online, through official Maine Visitor Information Centers, and at numerous domestic and Canadian travel and trade shows. The annually produced Aroostook Visitor Guide is the primary publication used by ACT to attract first-time and returning visitors to the year-round offerings of the entire region. The guide contains articles, photography, maps, an event calendar, and information on dining, lodging, and recreation—everything visitors need to plan an Aroostook County vacation. The guide offers a limited number of advertising opportunities for tourism businesses looking to generate more attention for their business. Those interested in placing an ad should contact Matthew Kovacevich for rates and information at mattk@nmdc.org. Ad sales end March 15, 2017. Additionally, those businesses serving visitors to the region are urged to send Aroostook County Tourism their information to be included in the organization’s database of businesses serving those who visit Aroostook County. Categories of content that ACT is seeking to update in 2017 include: Lodging (all kinds), Restaurants, Shopping, Attractions, Guides & Outfitters, Agri-tourism. To submit your tourism business information to Aroostook County Tourism: Send an email to Mr. Matthew Kovacevich at mattk@nmdc.org before Feb. 28, 2017 (no calls please), including “New Info” and the name of your business in the subject of the email. Emails should contain the following info: the general category of business, business and owner name, operating location, seasonal operating information (if not year-round), phone number, email address and website. Those sending information should be engaged in business that serves visitors to the Aroostook County region. Information/Updates submitted by phone will not be collected. The Business Finance Division of NMDC completed loans with three clients in December and January. Kim Lauritsen owns MoonDance Studios, which is a long-standing business in central Aroostook that has been providing a variety of dance and pageant training programs. The company has recently further expanded their business to include gymnastics and competitive cheering and used their loan to purchase new equipment for these programs. Wade Snyder is starting a new fuel delivery service, Ridge Runner’s Fuel & Oil, which will be providing fuel delivery to Perham and surrounding towns. The loan will enable Snyder to purchase one additional truck, have working capital for permits and site engineering plans for fuel storage, and to purchase initial fuel inventory. Brent Johnson is using loan funds to purchase a 30-acre lot in Stockholm. His plans are to build 20 self-storage units on the property and to open as Stockholm Storage in late summer. The event, sponsored by Aroostook Partnership, is an opportunity for members of the private, public and nonprofit sectors of Aroostook County to interact directly with the Aroostook County delegation and other legislators from downstate. The second panelist, Dana Doran, Executive Director of the Professional Logging Contractors of Maine, presented a quick look at the forest economy of Maine and recent recommendations to improve its outlook. Doran said the industry is facing challenges, but there are five important efforts to grow the forest economy. The first of which is to conduct a global market analysis for future wood products. The other steps include a conduct a statewide wood supply analysis, grow low value wood opportunities and develop an integrated marketing plan. 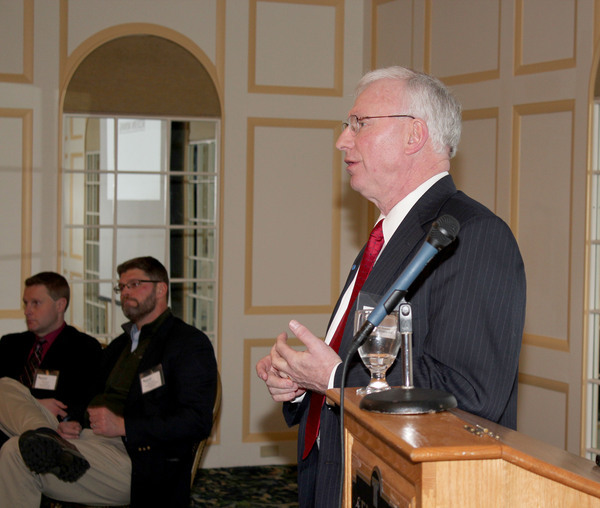 Photo caption: Aroostook Partnership President Bob Dorsey addresses the attendees at Aroostook Day at the Legislature.